Smartphones have become a part of the individuals in all societies. This is also true for students. Studies on the effects of the use of smart devices in educational environments, especially during the course, have begun to attract the attention of researchers. The aim of this research is to seek answer to the question of the positive effects of the use of smartphones in the education processes of graduate students. In the case study, which was designed as a Type 1 study, 29 students who received masters and PhD training in 10 different departments in the Educational Sciences Institute of one of Ankara's established universities were involved. According to the opinions obtained through the feedback form from participants who declared that most of them use a smartphone for more than 4 hours a day, it was determined that they used these devices for searching the subject or the term of the course, academic research, following course materials, taking notes via photographs or voice notes, communicating with peers and instructors, and so on. Tüm toplumlara bakıldığında akıllı cep telefonları bireylerin birer parçası haline gelmiştir. Bu durum öğrenciler için de geçerlidir. Eğitim ortamlarında özellikle de ders sırasında akıllı cihazların kullanımının etkileri üzerine yapılan çalışmalar, araştırmacıların dikkatini çekmeye başlamıştır. Bu araştırmanın amacı, yüksek lisans öğrencilerinin eğitim süreçlerinde akıllı cep telefonu kullanımının olumlu etkilerine yönelik görüşleri nelerdir sorusuna cevap aramaktır. Durum çalışması Tip 1 olarak desenlenen araştırmada Ankara’nın köklü üniversitelerinden birinin Eğitim Bilimleri Enstitüsünde yer alan 10 farklı anabilim dalında yüksek lisans ve doktora eğitimini alan 29 öğrenci ile çalışılmıştır. Çoğunluğunun günde 4 saatten fazla akıllı cep telefonu kullandığını beyan eden katılımcılardan görüş formu yoluyla elde edilen görüşlere göre, bu cihazları daha çok derste geçen konu ya da terimi araştırma, akademik araştırma, ders materyallerini takip etme, fotoğraf ya da sesli not özelliği ile ders notu alma, akran ve öğretim elemanı ile iletişim amaçlı kullandıkları gibi, sıkılma nedeniyle ders ile ilgisi olmayan bildirimlerin ya da saatin kontrolü gibi eylemler için de kullandıkları belirlenmiştir. Aljomaa, S. S., Al.Qudah, M. F., Albursan, I. S., Bakhiet, S. F., & Abduljabbar, A. S. (2016). Smartphone addiction among university students in the light of some variables. Computers in Human Behavior, 61, 155e164. http://dx.doi.org/10.1016/ j.chb.2016.03.041. Al Hamdani, D. S. (2014). A constructivist approach to a mobile learning environment. International Journal of Computer Applications, 93(4), 41-46. Anshari, M., Almunawar, M. N., Shahrill, M., Wicaksono, D. K., & Huda, M. (2017). Smartphones usage in the classrooms: Learning aid or interference?. Education and Information Technologies, 22(6), 1-17. Au, M., Lam, J., & Chan, R. (2015). Social media education: Barriers and critical issues. In Technology in Education. Transforming Educational Practices with Technology, 199–205. Springer Berlin Heidelberg. Bolliger, D. U., & Shepherd, C. E. (2016). Instructor and adult learner perceptions of the use of Internet‐enabled devices in residential outdoor education programs. 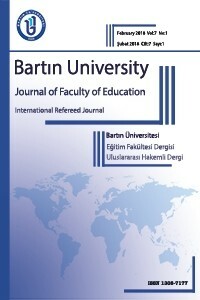 British Journal of Educational Technology. Bull, G., & Thompson, A. (2004). Establishing a framework for digital images in the school curriculum. Leading and Learning with Technology, 31(8), 14-17. Burton, A. (2015). Lecturers’ experiences of using wikis to support student group work. Innovative Practice in Higher Education, 2(2). Chen, S., & Tzeng, J. (2010). College female and male heavy internet users' profiles of practices and their academic grades and psychosocial adjustment. Cyberpsychology, Behavior, and Social Networking, 13(3), 257–262. Creswell, J.W. (2003). Research design: Qualitative, quantitative, and mixed methods approaches. California: Sage Publications Inc.
Dahlstrom, E. (2012). ECAR study of undergraduate students and information technology, (Research Report), 2012. Educause) (Louisville, CO: ECAR). Dahlstrom, E., & Bichsel, J. (2014). ECAR study of undergraduate students and information technology, (Research Report), 2014. Educause (Louisville, CO: ECAR). Dietz, S. & Henrich, C. (2014). Texting as a distraction to learning in college students. Computers in Human Behavior, 36, 163-167. Duncan, D., Hoekstra, A., & Wilcox, B. (2012). Digital devices, distraction, and student Performance: Does in-class cell phone use reduce learning? Astronomy Education Review, 11, 010108-1, 10.3847. Felisoni, D. D., & Godoi, A. S. (2018). Cell phone usage and academic performance: An experiment. Computers & Education, 117, 175-187. García-Ormaechea, I., González, I., Duplá, M., Andres, E., & Pueyo, V. (2014). Validation of the preverbal visual assessment (PreViAs) questionnaire. Early human development, 90(10), 635–638. Hartnell-Young, E., & Vetere, F. (2008). A means of personalizing learning: Incorporating old and new literacies in the curriculum with mobile phones. Curriculum Journal, 19(4), 283-292. Hawi, N. S., & Samaha, M. (2016). To excel or not to excel: Strong evidence on the adverse effect of smartphone addiction on academic performance. Computers & Education, 98, 81-89. Judd, T. (2014). Making sense of multitasking: the role of Facebook. Computers & Education, 70, 194-202. Junco, R., & Cotten, S. R. (2011). Perceived academic effects of instant messaging use. Computers & Education, 56(2), 370-378. Just, M. A., Carpenter, P. A., Keller, T. A., Emery, L., Zajac, H., & Thulborn, K. R. (2001). Interdependence of nonoverlapping cortical systems in dual cognitive tasks. NeuroImage, 14(2), 417-426. Karpinski, A. C., Kirschner, P. A., Ozer, I., Mellott, J. A., & Ochwo, P. (2013). An exploration of social networking site use, multitasking, and academic performance among United States and European university students. Computers in Human Behavior, 29, 1182-1192. Kim, I., Jung, G., Jung, H., Ko, M., & Lee, U. (2017). Let’s FOCUS: Mitigating Mobile Phone Use in College Classrooms. Proceedings of the ACM on Interactive, Mobile, Wearable and Ubiquitous Technologies, 1(3), 63. Kukulska-Hulme, A. (2007). Mobile usability in educational contexts: What have we learnt? The International Review of Research in Open and Distance Learning, 8(2). Kuznekoff, J. H., Munz, S., & Titsworth, S. (2015). Mobile phones in the classroom: Examining the effects of texting, Twitter, and message content on student learning. Communication Education, 64(3), 344-365. Lee, J., Cho, B., Kim, Y., & Noh, J. (2015). Smartphone addiction in university students and its implication for learning. In Emerging issues in smart learning (pp. 297-305). Springer, Berlin, Heidelberg. Markett, C., Sanchez, I. A., Weber, S., & Tangney, B. (2006). Using short message service to encourage interactivity in the classroom. Computers and Education, 46, 280-293. McCoy, B. (2013). Digital distractions in the classroom: Student classroom use of digital devices for non-classroom related purposes. Journal of Media Education, 4(4), 5-14. Mitchell, K. J., Finkelhor, D., & Wolak, J. (2005). Protecting youth online: Family use of filtering and blocking software. Child abuse & neglect, 29(7), 753-765. Muñoz, C. F., & García, F. G. (2016). The use of mobile phones as tools for access and knowledge exchange by students in Spain when studying: Access to leisure, persuasive and regulated schooling contents; key factors to take into consideration to plan targeted advertising campaigns. Prisma Social, (1), 190-208. Nakamura, H., Hanamitsu, N., & Minamizawa, K. (2015). A (touch) ment: a smartphone extension for instantly sharing visual and tactile experience. In Proceedings of the 6th Augmented Human International Conference, 223–224. ACM. O'Bannon, B., Dunn, K., & Park, Y. (2017, March). Validation of Mobile Phone Use in the Classroom Survey. In Society for Information Technology & Teacher Education International Conference (pp. 1033-1041). Association for the Advancement of Computing in Education (AACE). Olmstead, K. (2017). A third of Americans live in a household with three or more smartphones [monograph on the Internet]. Washington, DC: Pew Research Center. Ophir, E., Nass, C., & Wagner, A. D. (2009). Cognitive control in media multitaskers. Proceedings of the National Academy of Sciences, 106(37), 15583-15587. Roodt, S., de Villiers, C., Johnston, K., Ophoff, J., & Peier, D. (2014). YouTube as an academic tool for ICT lecturers. Proceedings of the e-Skills for Knowledge Production and Innovation Conference 2014. Rosen, L. D., Carrier, L. M., & Cheever, N. A. (2013). Facebook and texting made me do it: media-induced task-switching while studying. Computers in Human Behavior, 29(3), 948e958. Smith, A., McGeeney, K., Duggan, M., Rainie, L. & Keeter, S. (2015). US smartphone use in 2015. Pew research Center. Retrieved from http://www.pewinternet.org/files/2015/03/PI_Smartphones_0401151.pdf. Tesch, F., Coelho, D., & Drozdenko, R. (2011). We have met the enemy and he is us: Relative potencies of classroom distractions. Business Education Innovation Journal, 3(2), 13-19. Tindell, D. R., & Bohlander, R. W. (2012). The use and abuse of cell phones and text messaging in the classroom: a survey of college students. College Teaching, 60(1), 1-9. Thomas, K., & Orthober, C. (2011). Using text-messaging in the secondary classroom. American Secondary Education, 39(2), 55-76. Thomas, K., O’Bannon, B. W, & Britt, V. G. (2014). Standing in the schoolhouse door: Teacher perceptions of mobile phones in the classroom. Journal of Research on Technology in Education, 46(4), 373-395. Wang, Y., Wu, M., & Wang, H. (2009). Investigating the determinants and age and gender differences in the acceptance of mobile learning. British Journal of Educational Technology, 40(1), 92–118. doi:10.1111/j.1467-8535.2007.00809.x. Wood, E., Zivcakova, L., Gentile, P., Archer, K., De Pasquale, D., & Nosko, A. (2012). Examining the impact of off-task multitasking with technology on real-time classroom learning. Computers & Education, 58, 365–374. Yoon, J. Y., Moon, J. S., Kim, M. J., Kim, Y. J., Kim, H. A., Heo, B. R., Kim, J. E., Hong, H. J. (2011). Smartphone addiction and health problem on university students. Journal of Korean Association for Crisis and Emergency Management, 3(2), 92-104.